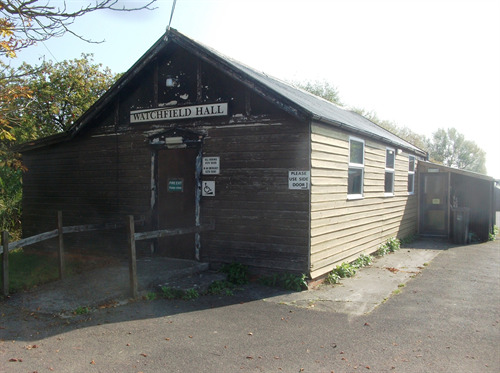 The Watchfield Hall was first opened on 25th January 1933 and cost £189 to build. This money was raised by local residents. It was built on land leased and later given to the hall by the Heal family who farmed at Woodbine Farm, Walrow. Over the years it has been added to and extended - the last extension was added in 1952. It has been used over the years for dances, whist drives, private parties, wedding receptions, meetings etc and has been maintained by the Committee at the time. With the advent of television, it went through a period when it was not used so much and fell into a state of disrepair. In the late 1970s a new Committee was formed who worked hard to bring it back to a reasonable condition. Since then it has been improved and maintained. In 2015 the present Committee decided to re-clad the exterior and apply for grants to cover the costs. An architect was employed to oversee the work. He, in turn, employed a structural engineer to survey the hall to assess the general condition and suitability for this work. Unfortunately he found the roof was sagging slightly caused by the building being extended in the past without adequate strengthening. In his opinion the hall was in danger of collapsing in the event of extreme weather conditions. On further inspection he found the materials used to build the hall were not up to present day building specifications. The work required to remedy this situation and render the hall safe for use would cost more than building a new hall. With a heavy heart the Committee decided the only sensible thing to do was to shore up the interior with scaffolding which would make it safe to use and let in the short term whilst raising funds to build a new hall in the not too distant future. To this end fortnightly bingo sessions are continuing together with coffee mornings. Various other events will be arranged and announced in the future. In the meantime the hall is available to hire for small parties, meetings etc and the Committee would be grateful for all offers of support.